Cracked capillaries occur for many reasons, and while most do not present a serious health problem, they may look ugly, but it may explain why people want to hide or remove them. The following reasons may be the cause of visible capillaries: the genetic factor, obesity, increased alcohol intake (thus the damage to the liver), pregnancy, hormonal disorders, skin damage, and many others. Cracked capillaries on the legs are slightly more common in women from eighteen to thirty-five, or between fifty and sixty years. Below we will show you how you can solve this problem, naturally, but also refer to modern medicine which can help. Reducing body weight and increasing physical activity are preventive measures that will increase venous circulation and prevent the formation of enlarged capillaries. Why capillaries burst on the legs, what is the cause? Hereditary factors are the main prerequisite: Genetics is one of the most common pre-conditions for the formation of broken capillaries. If your parents and grandparents have had problems with damaged blood vessels there is a chance that it will eventually occur with you. Many hormonal disorders can lead to the formation of gossamer capillaries, because the body is trying to get used to the new changes, so these changes happen more frequently in women than men. Periods in which it usually happens is puberty, pregnancy and menopause. Any form of trauma and injury to the skin can damage the blood vessels. Examples of wounds, surgery on the skin, or a strong cosmetic treatments. In the process of aging, we lose elastin and collagen from the skin, because they are not regenerated quickly enough. This leads (along with many other factors) to the thinning of the skin, and capillaries on the legs are stronger. The skin also loses its elasticity, so it is easier to get hurt. 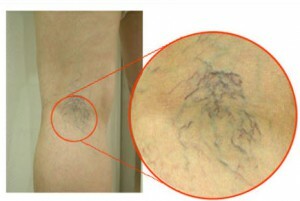 Cracked blood vessels are more common in old age, but unrelated, these skin lesions are common in almost all age groups. The influence of external factors such as sun, wind, extremely high and low temperatures causes the capillaries to burst. It is known that UV rays and increased exposure to the sun without applying sunscreen cause the blood vessels bursting. The movement between the different temperatures can lead to the aforementioned problems. If this is the case, avoid saunas and hot showers. Fruits and vegetables such as spinach, citrus fruits, cauliflower and sprouts are very rich in vitamins C and K, which can help to reduce your risk of getting cracked capillaries. You can also use a supplements of these vitamins, but we always recommend natural resources and they are a much better solution. Also, remember to get the most vitamins from fresh ingredients, long cooking loses a significant percentage of the vitamin content of fruits and vegetables. Oil with Vitamin E can be used as a natural medicine to treat broken capillaries. With regular application of this oil you nourish the skin, but also protect and regenerate damaged blood vessels. Also Vitamin E can be consumed as a supplement. Lemon juice contains a lot of vitamin C and has a natural bleaching effect, so that if it is applied directly to the problem area you can affect the expanded capillaries. You can try and add the lemon juice in a body lotion that you normally apply to the legs to reduce capillaries, strengthen the wall of blood vessels and reduce redness. Protect your skin from the sun and wind, keep it hydrated, and protect it from sudden temperature changes. Do not strongly rub the skin in the shower, as it may contribute to this problem. Also, avoid using hot water for bathing and showering. Use lukewarm water, even the cold water if you can stand it, because it narrows blood vessels and has a beneficial effect on health. The extract of grape juice proved to be an excellent remedy for the removal of visible capillaries. Simply apply the juice on the skin where there is damage and regular application will lead to the reduction of the problem. The heat of the sun can cause skin damage. Sunscreen will not only prevent cracking, but also nurture your skin's natural beauty. UV rays have a powerful effect on your skin and can damage the cell walls of your skin. Leading a healthy lifestyle can avoid developing cracked capillaries. Smoking has an oxidizing effect on cells, which weakens and damages the blood vessels. Avoid smoking, to prevent deterioration of the vascular system, thus preventing these undesirable changes on the skin. Drinking alcohol dilates blood vessels and leads to the formation of gossamer veins. Chronic intake of alcohol leads to liver damage leading to even stronger appearance of broken capillaries. Laser treatment works by sending the powerful beams of light on the problematic blood vessel, and destroys it gradually. Needles are not used and nothing is injected into the skin. Side effects may occur, for example, bruising, redness, itching, or swelling of the skin. A complication is also a blistering phenomenon on the treated skin, which can result in scarring. Laser treatment may be less effective than sclerotherapy. Sclerotherapy or capillary sclerosis involves injecting a specific solution in the vessels, which Forces it to close (cuts off blood flow, and blood is diverted to healthy vessels) and treated blood vessel immediately fades. Sclerotherapy is a great way to treat damaged capillaries, if done properly. The procedure can be done without anaesthesia in the doctor's office. Side effects may be itching, swelling and discoloration of the skin on the treated territory. Contact your doctor or dermatologist for medication and nutritional supplements, as well as for medical creams that can help you with this problem. After review and assessment your doctor will determine the right treatment. Treatment can give results within a few days. Avoid using OTC products without prior consultation with a specialist. If this problem occurs during pregnancy, do not panic, but inform your doctor in a timely manner. We suggest that before medical solutions you first try a natural remedy for varicose veins on the legs. Engage in physical activity every day, to improve circulation, wear comfortable clothes and shoes made of natural materials. Avoid standing and sitting for a long time in the same position, avoid crossing legs as this affects the circulation, reduce salt intake, eat more fresh fruits and vegetables and reduce the intake of junk food and you are on your way to get rid of this problem.